On Thursday 17 January 2019 a road traffic accident occurred on the A149 - a main road in Norfolk running south to north and linking King's Lynn to Hunstanton - MAP. The accident site was the junction with the B1439. The B1439 goes from West Newton (near the Sandringham Royal Estate to the east of the A149) and joins the A149 at the Babingley crossing. To the west of that junction is a minor road to the ruined Saint Felix Chapel and Babingley. a Range Rover - driven by HRH The Duke of Edinburgh - and a Kia travelling north to south along the A149. The Range Rover was travelling from west to east and crossing the A149 with a view to travelling along the B1439. Fortuitously, no serious injuries occurred to anyone. The accident was well reported - see e.g. News.com.au - The Guardian 18 January 2019 - CNN.com 18 January. The time of the accident is stated to be around 3pm (1500 hours GMT). It is reported that the Duke said at the time that he had been “dazzled by the sun.” The sun, on a mid-January afternoon, would have been low in the southern sky. Sunset (King's Lynn) was at 16.35 hrs. The Kia, travelling north to south, would have been driving toward the low sun. The Duke would have had to look in a southerly direction before moving across the A149. The weather was dry, sunny and cold with a northerly wind. Police attended the accident scene and roadside breath tests were conducted with negative results. Such tests are permitted by the Road Traffic Act 1988 section 6(5). 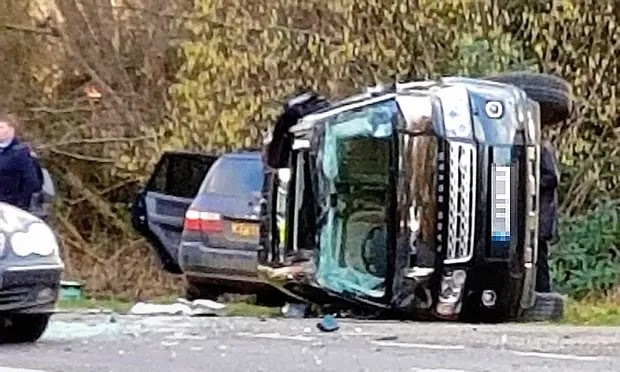 The Norfolk Constabulary conducted an investigation into the accident and the investigation file was passed to the Crown Prosecution Service for their consideration. The CPS confirmed on 14 February 2019 that it was not in the public interest to prosecute and that no further action would be taken. Read the Crown Prosecution Service statement. The decision was made after considering all the evidence submitted by the police and in accordance with the two stage test in the Code for Crown Prosecutors. The Code for Crown Prosecutors is a public document, issued by the Director of Public Prosecutions, that sets out the general principles Crown Prosecutors should follow when they make decisions on cases. There is the "Evidential Test" and then the "Public Interest Test." Is there enough evidence against the defendant? When deciding whether there is enough evidence to charge, Crown Prosecutors must consider whether evidence can be used in court and is reliable and credible, and there is no other material that might affect the sufficiency of evidence. Crown Prosecutors must be satisfied there is enough evidence to provide a "realistic prospect of conviction" against each defendant. Is it in the public interest for the CPS to bring the case to court? A prosecution will usually take place unless the prosecutor is sure that the public interest factors tending against prosecution outweigh those tending in favour. The CPS Statement notes - “We took into account all of the circumstances in this case, including the level of culpability, the age of the driver and the surrender of the driving licence." The surrender of the licence therefore appears to be a key factor in the decision not to prosecute. Taking into account all the circumstances in the case would undoubtedly have included the absence of any serious injuries to anyone. Technically, the Duke could have been prosecuted for an offence such as Careless Driving - Road Traffic Act 1988 section 3. By section 3ZA - "A person is to be regarded as driving without due care and attention if (and only if) the way he drives falls below what would be expected of a competent and careful driver." It appears from the Norfolk Police statement that the Duke was given advice about the need to wear a seat belt. As the Police note - " ... not wearing a seatbelt is considered one of the ‘fatal four’ offences which makes you more likely to be killed or seriously injured in a collision, along with drink/drug driving, using a mobile phone and speeding." Clearly this accident would not have attracted the attention of international news media but for the involvement of the Duke of Edinburgh. Nevertheless, it is a salutary reminder of the need to drive on the roads with appropriate care taking into account all the circumstances. At least in my view, the case is a sensible application of the full code test for prosecutions. Those over 70 years of age must renew their driving licence every 3 years. The DVLA has issued advice to the medical profession about assessing fitness to drive.